I feel like this post has been a long time coming. I’ve actually thought about what I would write many times over and never put pen to paper or in the case, texting thumbs to my blog app. Many titles for this post as well as emotions have entered my mind trying to create the perfect reflection to share my experience with push-in speech therapy. What I’ve decided is to blog about tips from my experience with room for prequel and sequel posts in an effort to break this writer’s block. Here’s the cliff note history of my push-in journey. I was interested as well as challenged years ago to begin pushing therapy services into classrooms. Last year, the push for this service delivery was greater and I found myself fully included in K-5 classrooms about 75% of my direct therapy time. The first quarter did not go well. I dreaded most of the experience and wanted out. I was completely uncomfortable and unsure I was going to be able to adapt to this change. Fast forward to now, with five additional school year quarters under my belt, I’m genuinely settled and might even tell you I’m not ever leaving the classrooms. I’m also beginning to witness the benefits that I was blind to before. 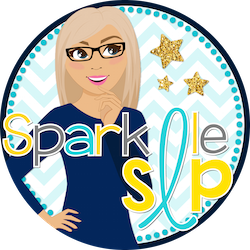 Since this post isn’t designed to share all my feelings, a pro and con list, specific logistics for caseload factors, or even how to start, I’ll rather move into sharing some tips from my experience providing speech therapy services in classrooms. Be true to yourself. Know your strengths and weaknesses. I am VERY anxious in new situations. I freeze in front of groups and become disfunctional, losing all my confidence. Going into classrooms was completely out of my comfort zone. I am, however, flexible and as a colleague once told me, I’m good at seeing the positive in others...so I used that to build relationships with teachers, slowly. Don’t get me wrong, I was awkward, often. As my comfort level rose, so did my confidence in interacting. Watch, listen and process what is happening in classrooms. This takes time and is different for each grade, teacher, subject area, etc. Find how you can best integrate yourself into their routine, at first. In my experience, small group time is ideal! Logistics inhibit a perfect schedule, just as with pull-out therapy. Be open to large group, at times. Also be open to subject areas you might not have initially entertained. Our focus was on the ELA time block. Enter that schedule problem of being in all ELA blocks while having a large caseload. Math, science, and social studies can be excellent times for push-in. Don’t forget about morning meetings, if your teachers incorporate this activity. Additionally, having a good understanding of the curriculum aids your ability to determine what students need to be successful. Don’t be afraid to abort the plan! You know the saying...best-laid plans. This doesn’t mean stop pushing in, this may mean trying something different. Pick a different subject or time. Reevaluate your students’ needs. Refer back to your observation notes! My schedule changes no more or less than it did with pull-out therapy. It’s what we do best, but I found it hard due to my comfort level. Tell teachers what you need, offer tips, ask questions and for suggestions. Ask for their plans or get their weekly newsletter sent to you, so you know the skills and strategies they are focusing on each week. This might be the most difficult and most important. Yes, you have far more control in your small group pull-out sessions. You can control the content, materials, prompts, the environment, the data you are collecting and so much more. You feel confident with your perfectly tallied data, know you have chosen materials to meet each goal and your prompts and cues are spot on. Classroom therapy may be different. Very different. You have far less control, at times. You may be using materials that are less familiar. Distractions are present and frequent. Different is not always negative, in fact I’ve found many differences to be quite positive. Remember, you are using your speech-language pathologist lens and the angle you take makes the experience therapeutic. Language is everywhere and we can provide strategies and practice of target skills for our students anywhere using any material. Being familiar with the curriculum allows you to determine the language underpinnings necessary for student understanding of the content. I cart around fewer materials with a bigger impact. I have streamlined the materials I use and try to use curriculum/classroom materials when I can. I keep visuals with me, organized for quick accessiblility. Check out posts here and here about my visuals. I spend less time and gain more focused therapy. I have the opportunity to do some 1-1 quick drill with students when necessary. I’m also getting more time on task because I’m not transitioning the students to another location and not needing a structured therapy routine that’s different from the classroom. Managing behavior takes far less time. My therapy is less mixed group and more focused on like goals. I’d like to tell you to start small, but since I did and continued to only do what was confortable for me, I never really immersed myself in the classrooms until I was pushed (silently kicking and screaming BTW). So, go ahead and push yourself. You can start small by keeping the way you provide the service in a similar fashion (just inside the classroom) until you have more comfort with how your services can evolve. Even as I’m finishing this post, I can’t believe the transformation I’ve made to accepting and even promoting push-in therapy. I’m still learning everyday and by no means is the path smooth; however, it wasn’t before either:)! I’ve gained confidence, a new perspective, built stronger collaborative relationships and have witnessed positive student benefits.